The above info came from Hamstarzchan, and was edited by yours truly (contact me). 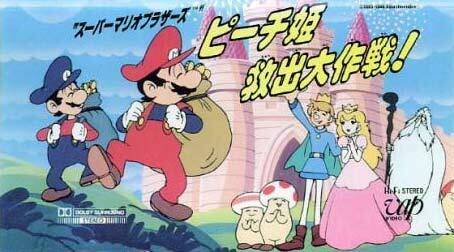 The image came from The Mushroom Kingdom. 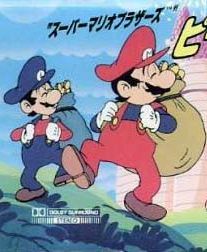 The story is quite simple, Mario and Luigi get sucked into their Famicom (NES) game and have to say Princess Peach from Bowser like they were the video game characters. (Weren't expecting that now, were you?) As the story progresses, you'll meet a wide list of characters that are creative in their own way. The movie was in development before Super Mario Bros. for the NES (Nintendo Entertainment System) was released to the Market, so many of the info and characters you see in the movie were not true, or whatever. Like the fact that the Toads look more like Cappy's from the Kirby anime. When the movie was released on video throughout Japan, it was only rentable at movie renting retails, never to be seen actually in a store. A copy of this movie can go up to $180 in Japanese audition stores. The movie was also never dubbed and will most likely never will be. Super Luigi Bros - This site has like everything you ever wanted to know about Mario.